Old Mac Pro? How about a new GPU? Recently we've had much fun testing pairs of the highest powered GPUs. Sobering up, we wanted to show you what is to be gained by upgrading from single graphics processors available from Apple as CTO or Retail Store kit. In other words, will pro apps that use GPU acceleration run a lot faster by replacing the Radeon HD 5770, Radeon HD 5870, or Quadro 4000 with a Fire Breathing GPU? TEST MULE: 2010 Mac Pro Westmere 3.33GHz Hex-Core with 24G of RAM, SSD boot drive, and Sonnet Tempo SSD Pro PCIe for scratch storage. OS X version was 10.8.4. NVIDIA GPUs used latest driver from NVIDIA website. DaVinci Resolve 9.1.4 adds speed and power to color grading of HD video. It uses the GPU to apply and playback multiple effects in real time -- no pre-rendering required. However, the more effect nodes created, the slower the playback. The full version of Resolve supports noise reduction which can seriously slowdown playback. 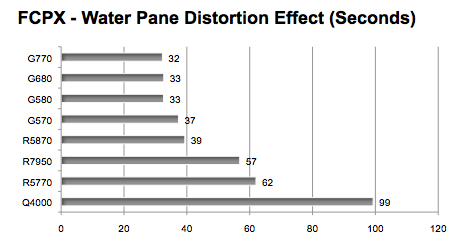 AMD GPUs don't support Noise Reduction, so we feature only NVIDIA GPUs in the graph below. 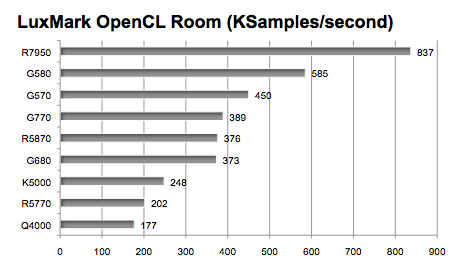 In this second graph, we rendered another OpenCL accelerated filter -- 15 degree Tilt Shift (500 pixel blur). In short, the gains you see with the best GPUs depend on what app you are running. The new Radeon HD 7950 Mac Edition is a bit schizophrenic. 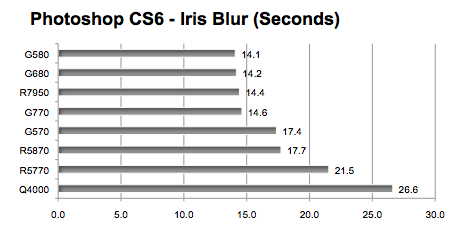 It was as fast or faster than the other optional GPUs running our Photoshop and LuxMark OpenCL tests. However, it was slowest running the Motion test. 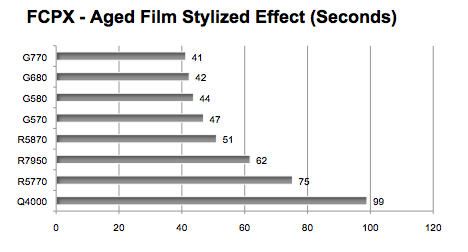 And the Radeon HD 5870 beat it in all three FCPX tests. Maybe when the drivers 'mature' it will do better. The new GeForce GTX 680 Mac Edition was faster than any of the Apple CTO and Retail kit GPUs in all tests except LuxMark. 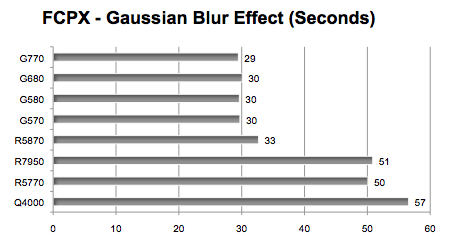 However, the flashed GeForce GTX 770 edged it out in the FCPX, Motion, Resolve, and Luxmark tests. 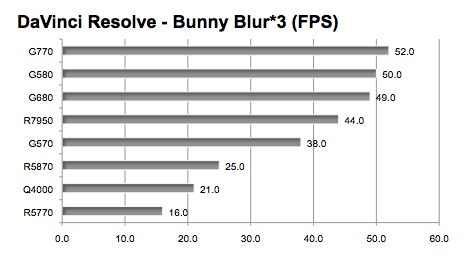 And the GeForce GTX 580 Classified edged it out in the FCPX, Resolve Blur, and Photoshop tests. The 580 clearly beat it in the Motion, Resolve Reduce Noise, and LuxMark tests. Looking at the graphs you must have noticed a linear advantage by some GPUs over others in apps like LuxMark and Motion. 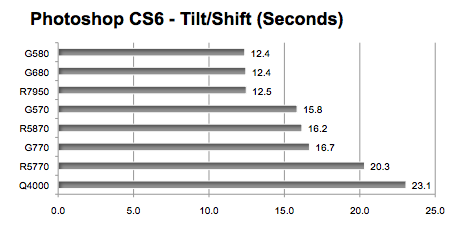 Yet in apps like Final Cut Pro and Photoshop, the top performers hit a wall. If you are trying to choose between an AMD Radeon GPU and an NVIDIA GeForce GPU, ask yourself if you are running CUDA enabled apps like After Effects (Ray-traced 3D particularly) and OctaneRender. If the answer is 'yes,' the choice should be NVIDIA. However, when those software publishers modify their apps to support the dual AMD FirePro GPUs in the soon-to-be-released Mac Pro, the AMD GPUs will be back in play. All the GPUs featured in this article should run on 2008 - 2012 Mac Pros. For 2006 - 2007 Mac Pros, check with the sources listed below for compatible options. The EVGA/NVIDIA GeForce GTX 680 Mac Edition can be ordered from EVGA direct or from Other World Computing (MacSales.com), Trans International (TransIntl.com), NewEgg, and Amazon. The flashed NVIDIA GeForce 570, 580 Classified, and 770 are available from MacVidCards. A 4G GeForce GTX 680 can be purchased from Mac*Pro. The NVIDIA Quadro K5000 for Mac is available from OWC and Amazon. The NVIDIA Quadro 4000 for Mac is available from OWC and Apple Store USA. The Radeon HD 5870 is available from OWC and Apple Store USA. USA readers can help us earn a commission by using this Apple Store USA link or by clicking on any Apple display ad. For GPUs, click the left side bar option for "For Mac > Displays & Graphics" to find the GPU kits available. Or if you are buying a new Mac Pro, you will find GPU options when you configure your order. For UK readers, visit Apple Store UK. Apple Store USA has refurbished Macs with 12 month warranty that can be extended to 36 months with AppleCare. Pay attention to the GPU it comes with. COREL PAINTER LITE for $19 or try the full version of PAINTER 12 for 30 days then get a $130 off on new purchase or $70 off the upgrade.